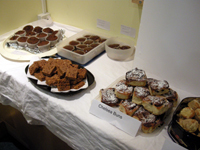 The selling continues – Neil sold more cakes yesterday, Sharon is cracking on with the raffle and Debbie’s sales technique is working its magic. It’s looking like the grand total from the sale is likely to be closer to £700! When we’ve counted it all up, we’ll let you know the scores on the doors. You can read all about the previous events by clicking on the sales4sam category in the right-hand column. A good time was had by all at the sale today. It was lovely to see so many stuff4sam supporters and friends. We had full tables of tempting cakes, hand-made cushions, fetching jumpers, cards, books, jewellery and other stuff. Our fun stall featuring a lucky-dip, guess the number of pennies in a jar, guess the name of the doll and raffle was also a big hit partly due to great prizes but also down to Sharon’s excellent promotional skills! The grand total on the day was £550! More is expected from further raffle ticket sales and other ongoing activities. Watch this space for the grand total before Christmas. As always big thanks to all who made or donated something – too many to mention here but to give some numbers we had nine cake bakers, eight prize donors, numerous crafty people and stuff donors. Thanks also to those who organised and staffed the sale (especially Debbie, Neil, Rachel, Clare and Sharon) and to those who came and spent. As a result of all your efforts we are that much closer to our big target! Tomorrow is the date of the 2008 stuff4sam sale featuring tasty cakes, jewellery, knitted flowers, cards, books, a raffle, lucky dip and guess the name of the baby. Many things have been donated or made for the sale so it should be a great event. We’ll update with pictures and totals once its all over and we have tidied up! 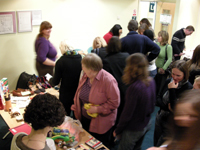 On Friday 19 September we held a Sale4Sam on the RNIB Peterborough site. Colleagues, relatives and friends kindly donated goods of all descriptions from soft cuddly toys to pictures to clocks! You should have seen it, four tables and looking every inch like a “car boot sale”! BUT we raised a total of £220.30. A colleague of Bronwen’s also very kindly donated a collection of brand new Beanies, which we sold along with the ongoing book sale in the restaurant. With the proceeds of these two sales plus book sales, we have this week banked a further £300. Big thanks to all who donated, attended and bought! We anticipate holding our next sale of unwanted gifts towards the end of January/early February.